Mary Wash Giving Day has ended! The Blue and Gray Press has raised $ 595 from 17 gifts! 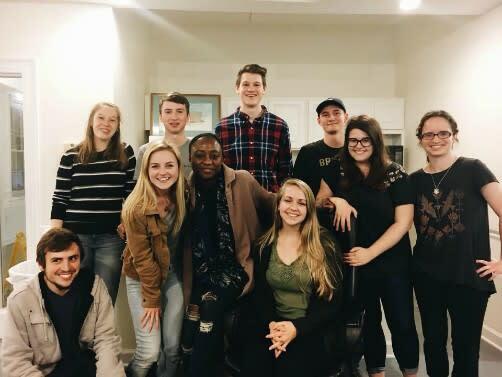 The Blue & Gray Press is the University of Mary Washington’s student-run weekly newspaper. Established in 1922 as the Bullet, the newspaper has served as a valuable source of student expression for nearly 100 years. 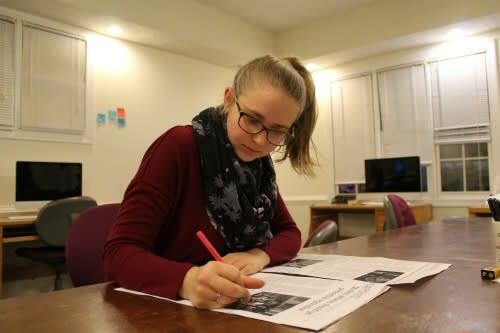 In its coverage, the Blue & Gray Press strives to highlight the UMW community, as well as deliver high-quality, fair and accurate coverage on the issues important to our students. All undergraduate UMW students are welcome to contribute to the newspaper, which is entirely student-managed and published without prior review from faculty. The Blue & Gray Press publishes twelve issues a semester on Thursdays. The Blue & Gray Press is currently the only student-run publication on campus, so it plays a vital role in our campus community. Many students utilize the newspaper to express opinions, to build portfolios and to gain experience. In addition to serving as a vital component of the journalism special major, the newspaper extends an experiential learning opportunity to students of all majors to gain experience in writing, interviewing, investigating, photography, editing, layout and design, digital studies, marketing, and management. The generosity of donors will help support the free student press at UMW. Donations will directly aid the production of the print and online editions of the newspaper through the purchasing of much needed equipment, including computers and cameras. Donations will also help improve the quality of articles by covering the cost of Freedom of Information Act (FOIA) requests. See what people are sharing about Mary Wash Giving Day! CHALLENGE MET! THANK YOU, ANDREW NELSON '09 AND OUR YOUNG ALUMNI DONORS! Andrew Nelson ’09 will match all Giving Day gifts to any designation from the classes of 2009-2018 with an equal gift to the Fund for Mary Washington, up to $1,600. FULL CHALLENGE MET! THANK YOU, YOUNG ALUMNI COUNCIL AND OUR YOUNG ALUMNI DONORS! When we reach 100 gifts from graduates of the last decade (2009-2018) between 11 a.m. and 2 p.m., the members of the Young Alumni Council will make a $1,500 gift to the Fund for Mary Washington! Be one of the 100 to unlock this challenge! FULL CHALLENGE UNLOCKED! THANK YOU, ED AND AMY WRAY SABO AND MARRIED ALUMNI DONORS! When 25 gifts are received from alumni who are married to other alumni, Ed and Amy will give $1,000 to the Fund for Mary Washington! Married alumni, make your gift to any area to help unlock an extra $1,000 to benefit students! FULL CHALLENGE MET! THANK YOU, VICE PRESIDENT FOR ADVANCEMENT AND UNIVERSITY RELATIONS LISA JAMISON BOWLING '89 AND OUR SENIOR CLASS DONORS! Vice President for Advancement and University Relations Lisa Jamison Bowling '89 is issuing a challenge to the senior class. When 89 gifts (a nod to Lisa's class, which is celebrating its 30th Reunion this year) are received from members of the Class of 2019 on Mary Wash Giving Day, Lisa will give $1,250 to the Fund for Mary Washington. Which areas are seeing the highest participation? Which area is receiving the most funding? Which class is in the lead for total number of gifts? WINNER: UMW DEBATE! Each designation that receives at least one gift between 12 a.m. and 1:59 a.m. will be entered in a random drawing for a bonus $500 gift. All 12 Nest Egg Prizes offered throughout Giving Day, totaling $6,000, are made possible by the generosity of Mike '95 and Katie Valentine Charnoff '04. WINNER: FIELD HOCKEY! Each designation that receives at least one gift between 2 a.m. and 3:59 a.m. will be entered in a random drawing for a bonus $500 gift. All 12 Nest Egg Prizes offered throughout Giving Day, totaling $6,000, are made possible by the generosity of Mike '95 and Katie Valentine Charnoff '04. WINNER: CENTER FOR CAREER AND PROFESSIONAL DEVELOPMENT! Each designation that receives at least one gift between 4 a.m. and 5:59 a.m. will be entered in a random drawing for a bonus $500 gift. All 12 Nest Egg Prizes offered throughout Giving Day, totaling $6,000, are made possible by the generosity of Mike '95 and Katie Valentine Charnoff '04. WINNER: COLLEGE OF BUSINESS! Each designation that receives at least one gift between 6 a.m. and 7:59 a.m. will be entered in a random drawing for a bonus $500 gift. All 12 Nest Egg Prizes offered throughout Giving Day, totaling $6,000, are made possible by the generosity of Mike '95 and Katie Valentine Charnoff '04. WINNER: MUSIC! Each designation that receives at least one gift between 8 a.m. and 8:59 a.m. will be entered in a random drawing for a bonus $500 gift. All 12 Nest Egg Prizes offered throughout Giving Day, totaling $6,000, are made possible by the generosity of Mike '95 and Katie Valentine Charnoff '04. WINNER: WOMEN"S BASKETBALL! Each designation that receives at least one gift between 10 a.m. and 11:59 a.m. will be entered in a random drawing for a bonus $500 gift. All 12 Nest Egg Prizes offered throughout Giving Day, totaling $6,000, are made possible by the generosity of Mike '95 and Katie Valentine Charnoff '04. WINNER: UMW GALLERIES! Each designation that receives at least one gift between 12 noon and 1:59 p.m. will be entered in a random drawing for a bonus $500 gift. All 12 Nest Egg Prizes offered throughout Giving Day, totaling $6,000, are made possible by the generosity of Mike '95 and Katie Valentine Charnoff '04. WINNER: MEN'S RUGBY! Each designation that receives at least one gift between 2 p.m. and 3:59 p.m. will be entered in a random drawing for a bonus $500 gift. All 12 Nest Egg Prizes offered throughout Giving Day, totaling $6,000, are made possible by the generosity of Mike '95 and Katie Valentine Charnoff '04. WINNER: STUDENT GOVERNANCE! Each designation that receives at least one gift between 4 p.m. and 5:59 p.m. will be entered in a random drawing for a bonus $500 gift. All 12 Nest Egg Prizes offered throughout Giving Day, totaling $6,000, are made possible by the generosity of Mike '95 and Katie Valentine Charnoff '04. WINNER: UMW LIBRARIES! Each designation that receives at least one gift between 6 p.m. and 7:59 a.m. will be entered in a random drawing for a bonus $500 gift. All 12 Nest Egg Prizes offered throughout Giving Day, totaling $6,000, are made possible by the generosity of Mike '95 and Katie Valentine Charnoff '04. WINNER: UMW SOFTBALL! Each designation that receives at least one gift between 8:00 p.m. and 9:59 p.m. will be entered in a random drawing for a bonus $500 gift. All 12 Nest Egg Prizes offered throughout Giving Day, totaling $6,000, are made possible by the generosity of Mike '95 and Katie Valentine Charnoff '04. WINNER: MEN'S BASKETBALL! Each designation that receives at least one gift between 10 p.m. and 11:59 p.m. will be entered in a random drawing for a bonus $500 gift. All 12 Nest Egg Prizes offered throughout Giving Day, totaling $6,000, are made possible by the generosity of Mike '95 and Katie Valentine Charnoff '04. Or you can contact us at umwgift@umw.edu.